Arlington Museum of Art, one of my favorite places around town has struck internationally-renowned gold again by hosting the playful and emotive exhibit Pablo Picasso: Ceramics. Running through February 12, 2017, catch a glimpse of Picasso’s work with a medium that set his imagination on fire near the end of his life. 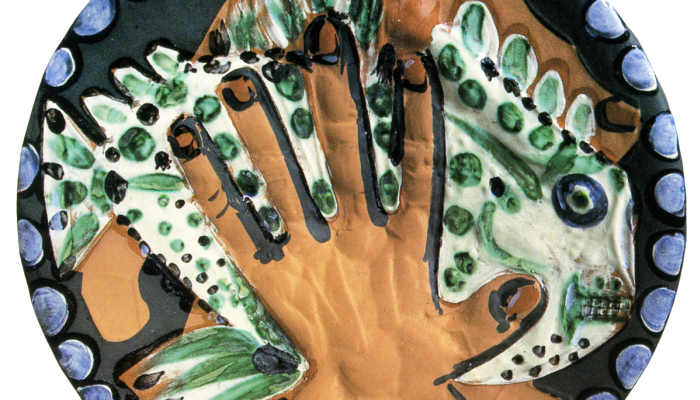 Even after all the international acclaim received from his paintings and drawings, he was drawn to this final medium of ceramics, where his experience with Cubism took on a 3D form in the form of plates, pitchers, trays, etc. His work with ceramics isn’t my favorite exhibit and Picasso isn’t my favorite artist, but slapping a name like Picasso on something so massive made me immediately interested in at least checking it out. See, he was introduced to ceramics by Georges and Suzanne Ramie, owners of the prestigious Madoura Pottery, who had given him permission to continue his drawing and painting work. He did that; but there he also created, left for a while, and came back to the three ceramic experiments from his time at Madoura Pottery. His enjoyment working with the medium led him to create over 100 ceramic works, some of which are on exhibit in The American Dream City. One of the things that are so captivating about this exhibit to me is that most of these items are so arbitrarily ignored in our fast-paced culture. Plates, pitchers, serving trays and the like are things that we go through like toilet paper in our homes. The pieces that Picasso brought to life capture his innate gravitation toward the absurd, and he applied that curiosity to these items. Depicting useful, yet unusable, everyday items as canvas of corruption and storytelling are enough to evoke a gratitude for the passion applied into making these pieces. Pablo Picasso was known for breaking all the rules, and he did so eloquently in a time when rules were not only strictly followed but idolized. With his discovery of a new form of expression, he did his best to manipulate this newfound freedom into built-from-clay items that are profoundly characteristic of his artistic spirit— unmatchable. Get into the spirit of Picasso with the “Uncorked” Pottery & Picasso this Saturday January 28 from 7-9pm at the Arlington Museum of Art. For $25 per person, relax with wine and decorate your own Picasso pottery led by local artist Cynthia Brinson. February 1st brings “Surviving Picasso” starring Anthony Hopkins for a movie night from 7-9pm. Last but not least February 4th from 7-9 there will be an “Uncorked” Painting & Picasso lead by local artist and painter Paula Mitchell, which is also $25. Call 817-275-4600 to set up your spot today. There are also commemorative handmade ceramic bowls for sale in the gift shop fired up by local artist and potter Cynthia Brinson of CiCi House of Clay. Some are replicas of Picasso’s work on display, while others are her original works. T-shirts and Picasso buttons and gift options are also in the gift shop, so stop by!